It appears that the current CB650F will be replaced next year by a CB650R employing this new design language from Honda. 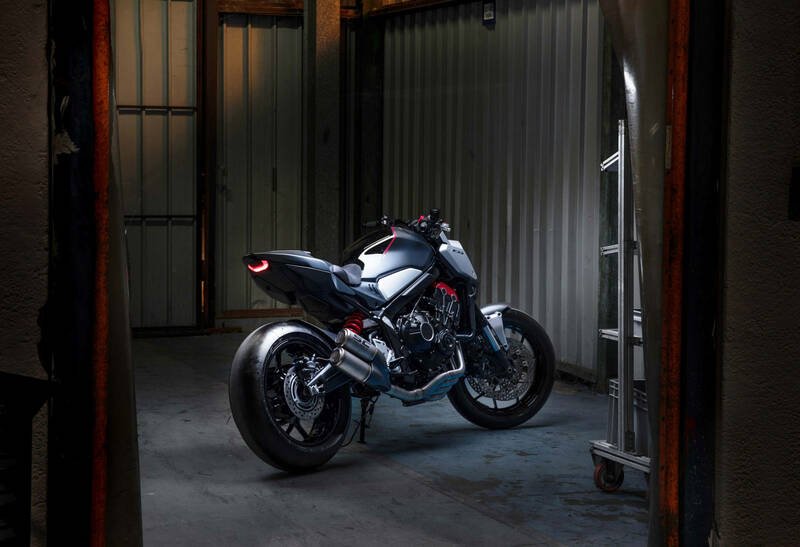 We suspect the bike will continue to use a, perhaps updated, version of the 649cc inline four-cylinder engine found in the CBR650F we recently tested. 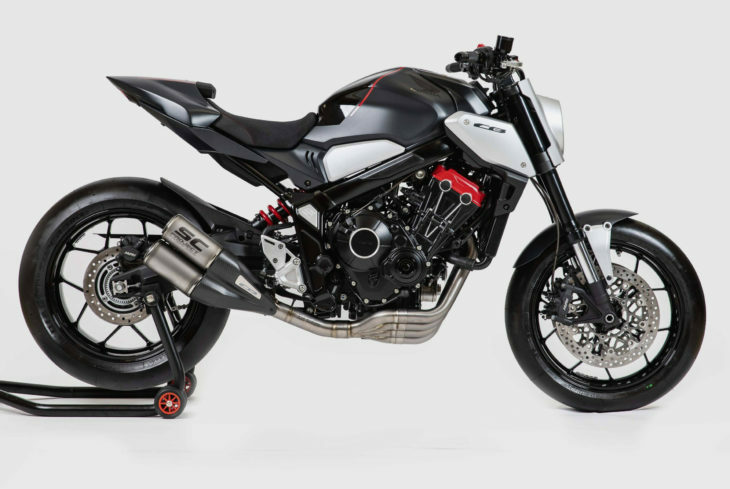 It’s possible that we will see a production version of this concept later this Fall at EICMA. Stay tuned. Meh. The 2007 Honda CB1100R concept is the one they should have built! Or the 2009 NAS (New American Sports)! Those were bikes worthy of _desire_. Those were bikes that did (respectively) ‘Retro’ and ‘Future’ RIGHT. No wonder millennials aren’t riding bikes. Nice bike. I hope the slicks make the cut in the showroom version. Ma , I really love it. I was just thinking the other day that the CB300R and CB100R look gorgeous but they’re not my speed. I’ve always wanted a 599 but if this comes stateside I’m trading in my Street Twin and jumping to #bigred. Clean, simple, functional lines would sell this bike. Honda is clever enough to design easily attachable luggage and passenger accommodations as options for those who want them. I would really appreciate designs like this is the minimalist approach, abbreviated features, and the manufacturing and design technologies over the last few decades actually delivered on the promises of what should, by now, be tomorrow. I look at the bike and I see the reduction of things that don’t really need to be there. That’s fine. Then I see that they have abbreviated areas for passengers or cargo. Well? Is it significantly lighter than a retro relatively minimalist 650? I’m sure it has more power. But isn’t that a really one dimensional expectation of the fruits of technology? I’ll be glad when this arse-up back end style runs it’s course. If you get caught in the rain or hit a mud puddle it’s gonna sling mud and slop all over you. I still get slopped by my 2017 Triumph T100 with a fully covered rear tire/fender. Well at least it doesn’t look like origami offal (yes entrails, not a bad spelling of awful). I can actually see a motorcycle in this. It’s growing on me. Take the 1st and last photos, then strike a vertical line at the intersection of the front of the seat and the aft edge of the tank. Forward of that line is a good aesthetic except for the headlight housing. Aft of that line mouth-vacuums. Me likey. Very nice…I happen to like modern as well as retro. I guess I am bi-cycle. I think it’s a good looking bike, not sure about the headlight, sort of resembles an electric meter. I would like to see those mufflers on BOTH sides of the bike. Used to enjoy the balanced look. Otherwise, why does this bike remind me of a wasp? I think they’re “quoting” the exhaust on the ‘70s CB400F. Could be, but I still like dual mufflers on both sides like back in the 70’s. I know, increased cost and all that, but still nice. If they duplicated the exhaust on both sides they would increase interest and yes sales by a good amount. The sound would also be a little different. Too bad they are too concerned with cost and magazine weight stats. Would make a nice line item option to check box at time of ordering by a customer at a dealer like cars back in the 60’s… I bet most would pick it if available. And you know this how? I for one don’t care for another poor on the other side just for the sake of symmetry. I love those pipes. I’d guess there’s going to end up being a large catalytic converter box there instead of that beautiful smooth junction. This is a great looking bike, and a nice reasonable engine size. Hopefully it’s not super small. I’m 6’1″, so some of these bikes I would otherwise like seem to have low seats and cramped legs for a tall guy. Anyway, kudos to Honda’s design team. Great concept bike. It’s a terrible bike because of this tiny detail involving the seat/lights/pipes/tail etc. that hurts my old man eyes! Why can’t all motorcycles look and handle like that two stroke death trap I had 40 years ago. Get off my lawn you kids! This is without a doubt my favorite post on MD ever. Is it wrong to say, “Nice cans. Really, really nice cans.” Great looking bike and packaging, but that exhaust system just makes it for me. Vibration adds character and “attitude” to a otherwise boring motorcycle. It’s about more than simply “vibration.” The frequencies of the vibration make a big difference. Lower frequencies, like from a V-twin or large, counterbalanced, 270-degree parallel twin, can actually be kind of pleasant, or at least, not obnoxious. High frequencies, like those of a buzzy inline-4, make hands and feet numb (and the sound doesn’t help matters). I hope they smoothed out that engine. I love 650 fours for real world riding, but only if they are perfectly smooth. The old FZ6, a bike I’ve owned twice, would have been perfect if only that damn engine didn’t vibrate so much. It’s funny how one can get used to such things. I, too, have owned an FZ6. Previous to that, I had owned a Z750S. The FZ6 felt like a turbine after riding the Z nearly 40,000 miles. The Z750S was simply an extremely harsh, vibey bike. Moreso than any other motorcycle I’d ridden long distances on. Oddly, though, it never bothered me enough to even start searching for solutions and fixes. I just dealt with it, and soon enough, just kinda got used to it. To me, bikes like the FZ6 and Z750S both had enough positive attributes to make some engine vibration not really that big of a deal to me. I definitely approve of extreme smoothness (’95 GPz1100), but I can certainly live without it. To me, Honda’s biggest problem with this bike was never engine vibration. It was simply a poor value. I could buy a Z900, a GSX-S750, or one of the FJ-09/MT-09/XSR900 triplets for -less- than I can ever find a CB650F for. The Honda isn’t even the peer of any of these bikes, nevermind advantageous in any single factor. Put a flat slightly lower seat on it and I would get it. Looks like we are seeing the death of the overdone transformers styling from the past decade (Kawasaki, Yamaha, and KTM have been the worst offenders as of late). That’s a good thing in my opinion. This is still a very modern looking bike, so I don’t think things are going too retro focused yet. Honda has really woken up from a couple decades of yawn inducing products. Wonderful time to be a naked sport bike enthusiast! Absolutely. Those ugly overdone bikes won’t age well (and quite frankly, looked like crap the moment they were released). I have a 2002 Honda 919 with styling that, while not cutting edge, will still look great even 20 years from now, as it takes cues from the timeless and classic motorcycle design of a round headlight and minimalist, industrial-mechanical aesthetics. That front bezel… I do not know if I like it. With advent of LED it could be stacked up/ rectangular and not as dominant. Other than that, the naked with some custom options is the best concept. Very nice bike! 650cc with four cylinders just like the old times. I love my ’78CB550K and the way it sounds with the one exhaust. Looks pretty cool. After seeing the CB300R, I’m still hoping that they do something similar to the CB500F model. I love my 500X and would be happy to put a cousin in the garage with that same, sweet motor. Looks killer. I guess it couldn’t be called a “CB” without an inline 4 but it would be even better imo if it had a 750cc parallel twin with the 270 degree crank. CB175, CB350, CB450, CB500T…….Notice they are using motors they already have, although they could use the motor out of the Africa Twin. They did use the Africa Twin engine in the Pioneer side by side. Gotta say, I don’t get the appeal of the parallel twin. I’ll take the better balanced 90 degree twin any day. Is a 90* V-twin any better balanced than a 270* crank parallel twin with a balance shaft? The P2’s advantages are numerous – more compact/lighter weight/cheaper to make & service by virtue of only having one head & valve drive-train. Full disclosure, I have only ever owned V2/V4 motorcycles and the P2 appeals to me for the above reasons.. I 100% agree with your maintenance sentiment since the valves on my old SV650 and Ducati are a huge pain, but with a 650cc or smaller engine the additional engine volume and weight end up not being much. Some 90 degree twins can be pretty shakey. They only have perfect primary balance in theory. P2s can be really smooth, regardless of their crank configuration. Just depends on how well the balance system is designed and executed. It’s still just a concept bike…….no turn signals, no mirrors, no passenger seat (nor passenger pegs…..I like that!! ), taillight is probably not legal (we will get a hemroid hanging out if it ever comes to the states)….but does look lightweight and nimble. Very good looking bike. Someone finally caught up to the design of the MV Agusta Brutale. That’s a bike that came out in 2001 by the way. My first thought was that it uses a lot of Brutale styling cues, which is a good thing in my book. Now, if I could get the CB1000 to look like this, I will 100% buy it. Yes, well this one is devoid of all the items that would make it legal. Its good to see more from Honda. It will likely undercut the Vitpilen 701 so I’m interested. I’d still rather it be the new FZ6 Yamaha instead though. If it was from Yamaha, it’d take years to get the prototype to production. Just look how long Yamaha has been teasing a Super 7. This is a very gorgeous machine with pipe organ exhaust, red head and LED headlight but by the time it gets to production, it’ll have a smoke stack exhaust can, bland black head and a tiny weasel headlamp. Looks good like something from the mind of Oberdan Bezzi. OK, that’s cool looking. 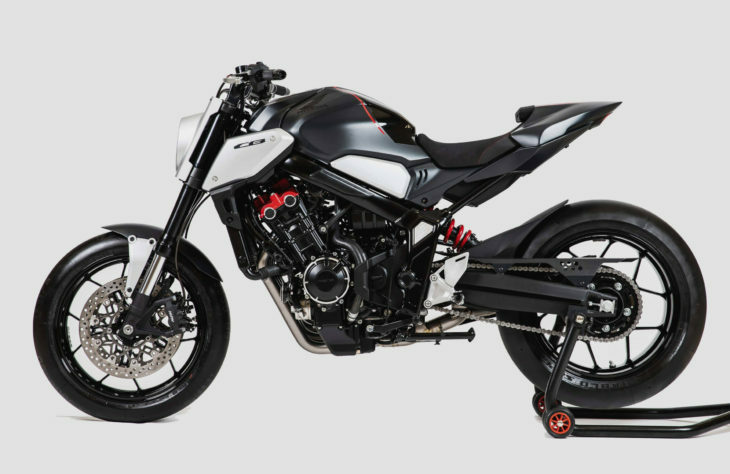 Needs a flat seat, and if this is a street bike, why all the tire clearance for the rear suspension ? Nice pipes . Actually I know the clearance thing is stylish . Very stylish . Make it a 750cc that puts 100 to 110 to the wheel and join the mid size party. The CB500 can take newbie duties. 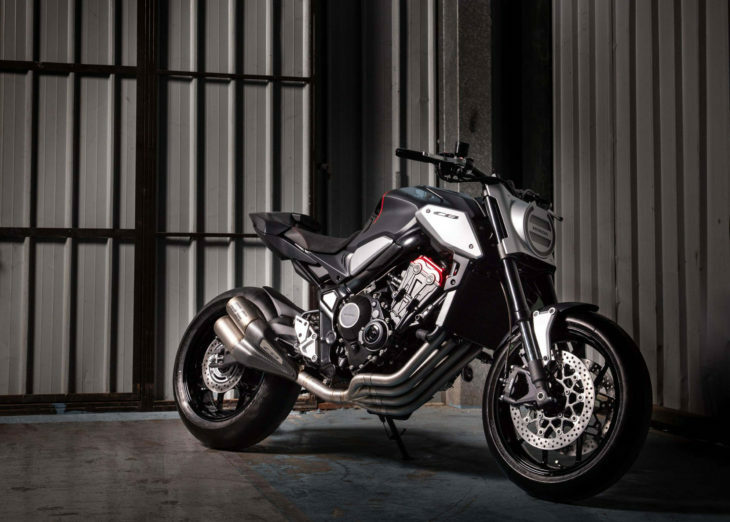 Only problem is that it would force Honda to up the power on the CB1000. Need to say, I didn’t come up with the 750 idea. Read it somewhere else. I like it. It has a very neo modern look. The header pipes are a work of art, a Honda hallmark. It looks like the designers ran out of ideas for the head light, but when they catch their breath and start designing the necessary road going items that are missing from the concept (turn signals, mirrors, license plate bracket) maybe they’ll take another crack at the headlight. Many will bemoan the CB650F as the baseline powerplant, but its a good match for a non-sports bike. The 650 class is well served with 70-90hp engines. This concept has great potential. I like the header too, but are my eyes deceiving me, or are all 4 head pipes different lengths? And, damn. This looks pretty awesome. No quite a winner with that headlight, and the tail looks truncated, but I like conservative Honda trying to push our expectations for once. It has been a long time since Honda made a memorable design. Why did you have to do that? I googled it and can’t stop laughing. Thanx for making my ribs hurt. oh, yeah, i did not recall “vultus”…nm4, yes. ick.